We must be prepared for things that go bump in the night. This includes an action plan, discussions with family members and optimally a weapon to defend yourself should the need arise. While the options surrounding that weapon are plentiful and diverse, most people will rely on their trusty handgun to get the job done. 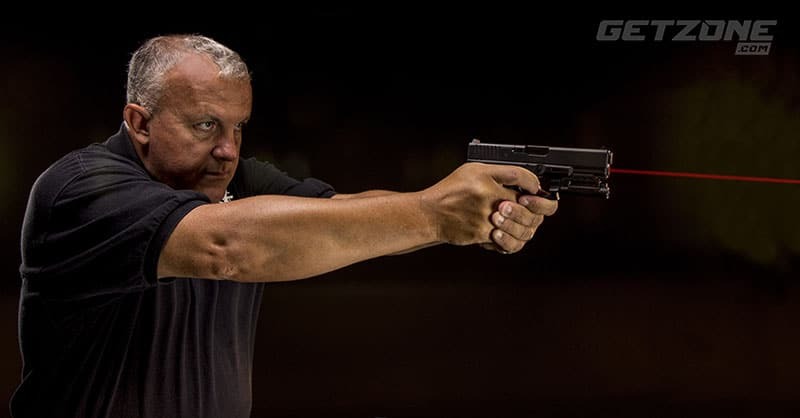 While there is nothing wrong with a handgun for home defense, I would like to make a few suggestions on just how to get the most out of your pistol in this application. The first thing we need to talk about is not gear, but mindset. If a handgun is your weapon of choice for home defense, I encourage you to dedicate it to that purpose. The reason being is that my home defense gun is configured differently than my every day carry gun. I will have it set up with things I would not have on my EDC. While I am sure there is a crowd that will cringe when I say this, you need to keep the gun loaded with one in the chamber and ready to fight at all times. It absolutely needs to be secured but you must also strike a balance between locking it up and access. Keeping it secured inside your gun safe in the basement isn’t going to do you much good when glass breaks in the middle of the night. There is a vast variety of quick and easy to use handgun safes that can be kept at your bedside or other easy to reach area. Look at where you store your gun and really consider how long it would take you to get your hands on it and bring it into action. As for what we do to the gun, the end user drives much of it. The size of the gun, the style all comes into play. What I can do is give you an overview of what I suggest and let you go from there. In all honesty, it is a pretty short list. The first item I suggest is a weapon-mounted light. The chances are very good a home invasion or burglary is going to happen at night. Statistics support this and common sense makes it even truer. Johnny dirtbag is generally not interested in a conflict with a homeowner. They will use the cover of night to get in and try to do what they want to do. With that being said we need to remember that we must be able to identify our threat before we start putting rounds on them. The news is replete with “accidental” shootings where a homeowner heard a disturbance, broke out their handgun and ended up shooting a family member coming home late or other situation. We must be able to see what we are about to shoot and make sure we need to shoot it. There are a growing number of companies making good lights but a couple of the best are Streamlight and Surefire. Both have several lights to choose from. 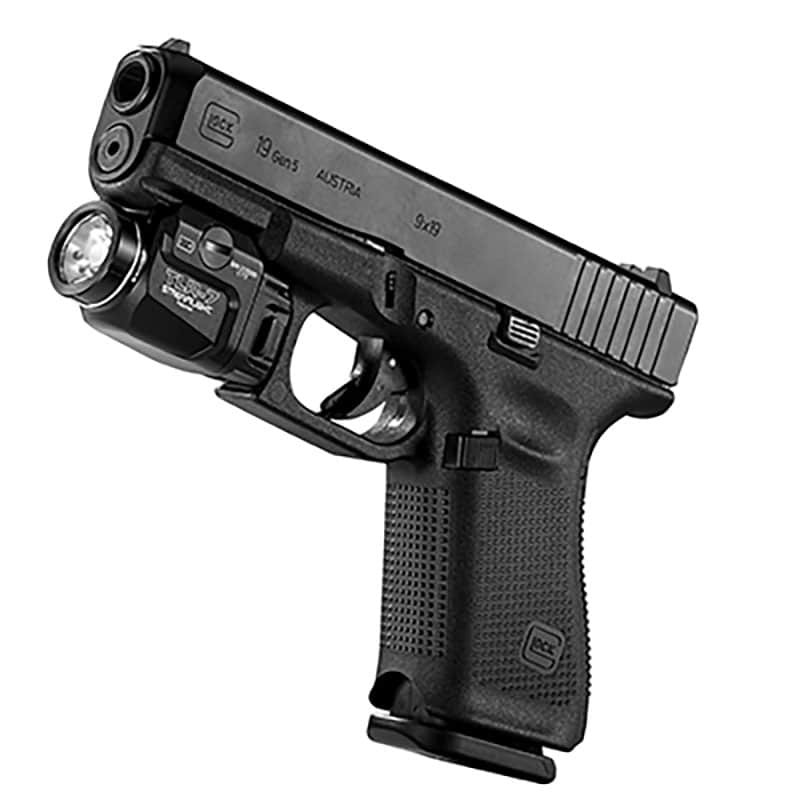 Streamlight TLR-7 weapon mounted light is a great addition to a home item defense gun. Another item I like to see on home defense handguns are lasers. In my opinion, lasers have a pretty narrow band of real application, but in the home they are exceptional. Unless you live in a 75,000 square foot mansion, chances are any shot you will have to take will be inside 20 to 30′ max. A laser helps me get my gun on target quickly so I can engage the threat. This is critical because of the small spaces we have to deal with. You will not have time to get a perfect stance, perfect sight picture and long smooth press of the trigger. Lasers are fast and help get you into the fight quickly. Crimson Trace and Laser Max pretty much own this space and make great products. A laser helps me get my gun on target quickly so I can engage the threat. The way you have a handgun set up for home defense is usually drastically different from your everyday carry gun. The last thing I encourage on home guns is low light sights. These serve a very interesting dual purpose. First and most importantly they allow you to see and align your sights. The second benefit for these sights falls into the “they were not made for that…but it’s a great byproduct”. 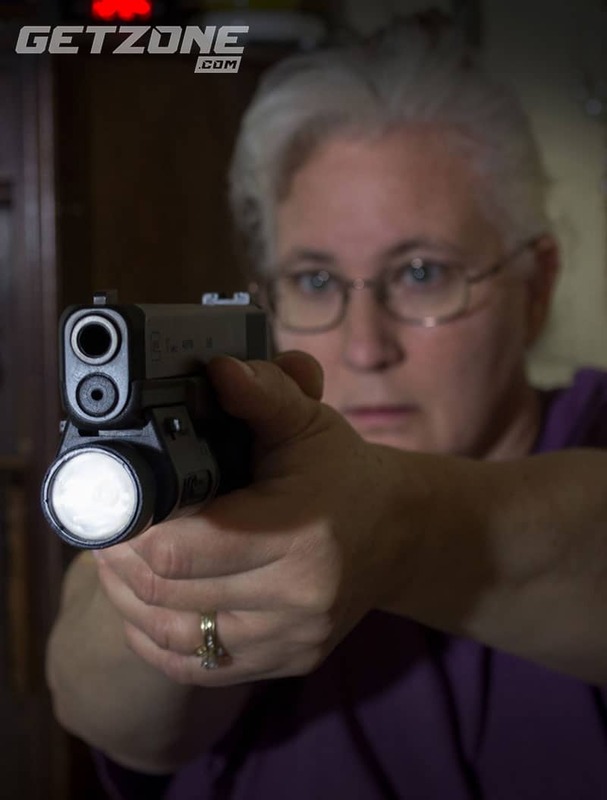 Night or low light sights are filled with tritium, which glows at night. If you have ever looked down at your sights in the dark you can easily see them glowing. This translates to easily seeing where your gun is at night. As I said, it is a fortunate byproduct. 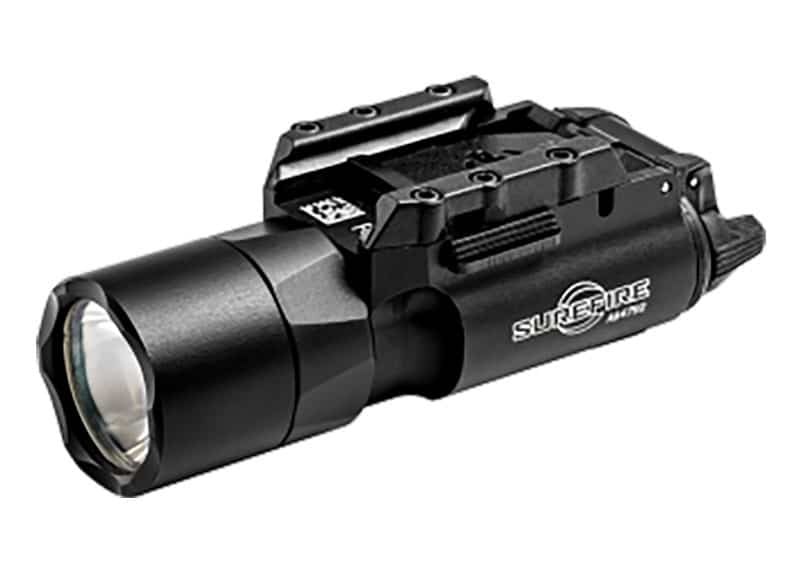 Another solid option in the weapon light arena is products made by Surefire. They offer a variety of options and have been leaders in this field for decades. Now that your gun is set up I would like to offer just a couple quick tips on using it in the home. When glass breaks in the night there are several things that will determine what your next steps would be. The most critical one is — do you have children or loved ones in the house? If not, I highly encourage you to grab your gun and get into a solid defensive position inside your bedroom. This position should have a clear view of the door but still, provide you some concealment. Next step is to call 911 and get help on its way. Do not leave this space unless you have to. You have a solid position and can easily engage any threats that make their way through your door. If you do have loved ones in other parts of the house, things get much more complicated. There is no safe way to move through a house when dangerous people are in the mix. It has been said that the only safe way to clear a house is to have someone else do it or to use artillery. One additional point on this before we get moving is to remember you are not a SWAT team and your goals are different. We need to get through the house as quickly and safely as we can to secure our loved ones. We are not going to methodically search the house. This is also where I tell you to seek serious professional training on the topic. This is a difficult skill and one that should not be taken lightly. There is no safe way to move through a house when dangerous people are in the mix. So we are forced to get moving through the house but we need to see where we are going and look for threats. If you can’t turn on the lights, I highly encourage you to have an additional flashlight for the actual searching component of this. “Searching by lighted muzzle” is extremely dangerous and should be avoided. You will already under a great amount of stress. Let’s avoid pointing the gun at anything we don’t want to shoot. Using a light in one of multiple low light searching techniques is the way to get the job done as safely as possible. If you do encounter a threat you can transition to your weapon light and go to work. If you encounter someone make sure they are someone that needs to be shot before you run the trigger. 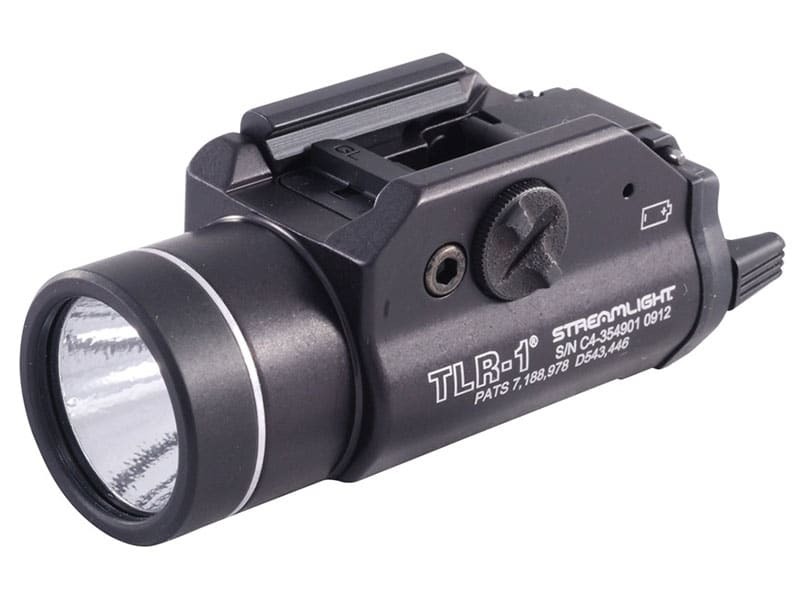 There are many great options for weapon lights including the TLR1 from Streamlight. Taking some time and set up your home defense handgun to meet your needs will pay off in the end. I can’t overemphasize the importance of being able to see what you are doing when you are going through the house under threat of violence. By building the best tool you can, the dangerous job ahead of you becomes a little easier.